When Jonah found himself alive in the belly of the great fish, he knew the mercy of God. He cried out in repentance, acknowledging his failure to obey God. Jonah tried to rule his own destiny, and it nearly cost him everything. Jonah survived to carry God's message to the people of Nineveh. Over the next 150 years, two more prophets, Zephaniah and Nahum, would repeat the task. But would the people of Nineveh-the Washington, D.C., of its time-heed the Lord's warning and repent? This book examines the danger of falling into the damnation of unappreciated mercy, especially by not maintaining an appreciative attitude towards God. And in some ways, it also tells us to be appreciative of the love, grace, and mercy we share in our relationships with each other. "A good exposition of the book of Jonah, appropriate for warning our generation to turn away from evil now and turn to the God of Heaven and Earth to avert His wrath." 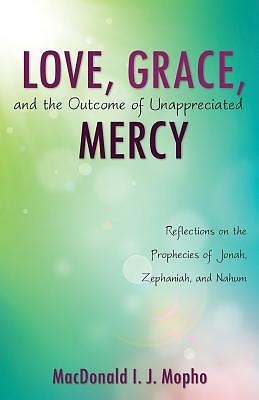 "This book elucidates the intricate connection between Love, Grace, and the Outcome of Unappreciative Mercy." MacDonald I J Mopho, LLM, MCIArb, CEDR-Accredited Mediator, was a Deacon and Trustee of Westminster Chapel, London, UK (2001-2008). He is presently a member of the Pastoral Team of RCCG Holy Pilgrim, London, UK. He has held several public appointments in the UK, including sitting as an Independent Member and Chairman, London Borough of Newham Standards Committee (2005-2009); and as a Lay Member for the Independent Advisory Group, General Practice Extraction Service under the Health and Social Care Information Centre, England.